← Is Tony Hawk the Richest Skateboarder the World Will Ever See? BIC may have made their name in the windsurfing arena, but that hasn’t stopped them branching out into surfing. Having been the market leader for around twenty years in the windsurfing domain, BIC thought it was high time that they turned their skills to a similar discipline, and it has to be said that the results have been impressive. Generally considered to deliver excellent surfboards at a fraction of the price of many of the top brands, BIC are carving themselves a niche in a market that had appeared saturated. BIC have been recognised with many design awards, and are always looking to innovate. Today we’re taking a look at their Sport ACS Magnum board, designed specifically for bigger surfers. The first thing we noticed about this BIC surfboard is the incredible construction. It’s quite clear that this thing is designed to be able to take the impact of a tank – or more likely a pounding from waves, and other wayward riders! It will take a lot to do any serious damage to a board like this, which makes it perfect for beginners and intermediate surfers who really want to get stuck into the sport. Second to its construction is the remarkable volume of the board. It is such that paddling to catch a wave is child’s play, and no matter what size you are, the buoyancy is good enough to keep you afloat, riding the wave. 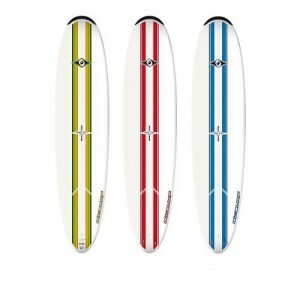 This is a solid, well balanced board that is remarkably easy to ride, and performs remarkably well in small swells. We took it out in less than two feet of surf, but found that it had the buoyancy required to ride right in even on a washed out wave. Conversely, we had the pleasure of dealing with a significant swell, with five foot waves. Not only did the board cope well and move quickly, it was also great for paddling out back. There were no problems getting out there, and the volume of the board meant that the board turns easily into faster waves. This is fantastic for intermediate surfers, wanting to gain that all important confidence that will allow you to progress as a surfer. Not to mention the fact that the more waves you catch, the quicker you will progress! Bigger wave riders are going to love the construction of this board. People upwards of 14 stone should have no problem riding this board, and there were zero buoyancy issues for our testers. It has proved to be a great board both for novices and intermediate surfers. Beginners find it easy to pick up waves with, and intermediate surfers felt that the board allowed them to try things they might not have been prepared to do on a less stable board. All in all, this is a board for almost any wave and almost any surfer. If you’ve grown up in the water, then you might want to find something a little more challenging, but for anyone looking to progress and anyone wanting to find a board that is good fun and durable, this could be the perfect board for you! This entry was posted in Reviews, Surfboards, Surfing and tagged Bic, BIC Sport ACS Magnum Surfboard, Surfboard. Bookmark the permalink.